When I lived in New York, passing a street performer was more common than passing a Sabrett hot dog stand…and sometimes just as fragrant! Just as you get to know your local hot dog chef, you begin to familiarize yourself with each street performer’s “shtick.” Forgive me; I had to throw a little Yiddish in there to get you in the New York state of mind. Amazing musicians, dog tricksters, space scene spray painters and silver covered “robots” with freaky masks delivering “coin-operated” break dance moves were scattered throughout the train stations and tourist areas with the occasional BEER MONEY or GOD BLESS YOU taped to their tip jars. In Florida, we are not blessed to have so much free entertainment available on the streets; however, our movie theater parking garage shares its real estate with our local Piano Man. You can always count on him to play one of his seven songs, repeating the same verse over and over again, making up the words as he goes along, trying to hit the high notes which are clearly out of his range. You can also count on the locals exchanging looks with furrowed brows in an effort to get affirmation that “those aren’t the words to that song.” And you can always count on my husband getting a dollar out of his pocket to give to my son to put in his tip bucket. 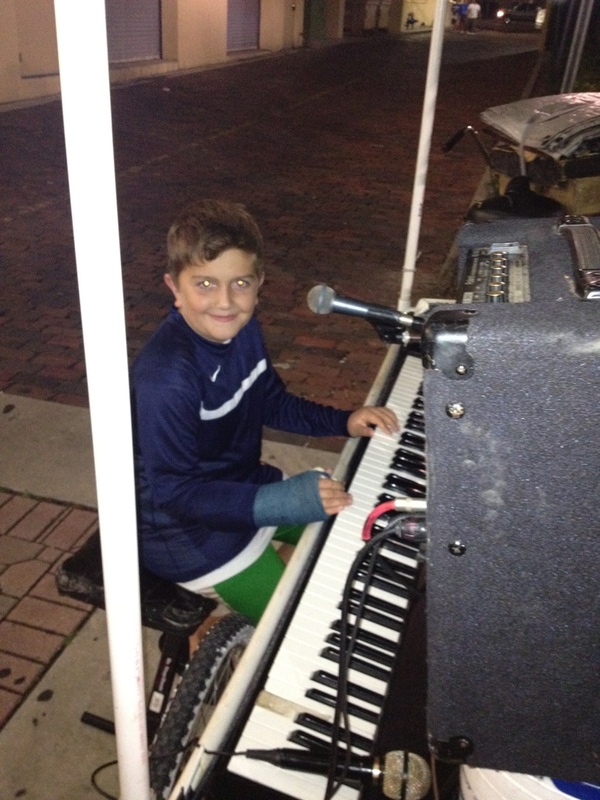 Brooks gets to tickle the ivories between songs! You are supposed to take care of your family and over the years, our Piano Man has become family. We count on him to be there. He provides a sense of familiarity and community. He loves what he does and puts a smile on our faces. And he counts on us to put a dollar in his bucket. We take care of each other. An off-tune hollah deserves at least a dollah!